We cooked with passion, ate with relish, and celebrated the holidays with gusto! Desserts, chocolates, and delicacies from our home countries were exchanged. We ate what we pleased and nothing was off limits. January 6 is here, and it’s time to get back on track with healthy eating. I’d like to start my blogging year on the right foot. So, my first recipe for this year is vegetarian, vegan, and nutritious. At least, I can say, I’ve started the year with good intentions. 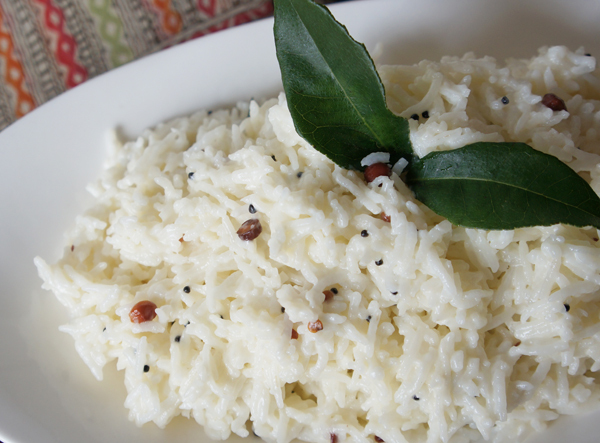 Rice is a staple, in most Indian homes, and you’ll find it on the table every day. Adding garbanzo beans to rice is an excellent way to add fiber, protein, and other nutrients to your diet. Adding a vegetable and a salad to this dish is all you need to make it a complete meal. Some of the vegetable dishes, from my blog, that you could use are: Eggplant in Tomato Curry, Green Bean Thoren, and Cauliflower Subzi. I used canned garbanzo beans in this recipe. You can also use dry garbanzo beans that you will find in your local grocery store. Just remember, soak them overnight, wash them in several changes of water, and cook them before you use them in this recipe. 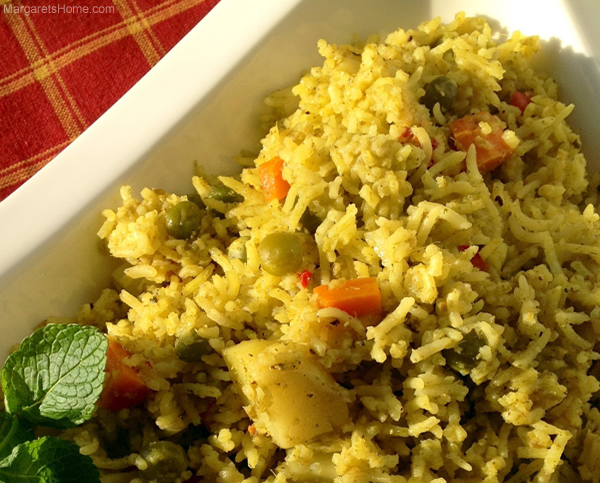 You can use chillies to make the rice spicy or leave them out completely. This dish is unique in that it is mild in flavor but rich in aroma. Many times that’s the kind of rice dish I’m looking for to accompany bold, flavorful curries. 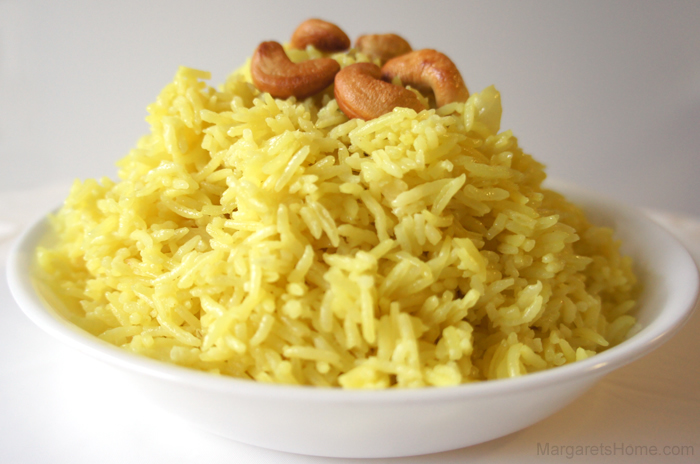 Well, this rice recipe is one of my favorites. You can bump up the flavor by switching water with vegetable stock. It’s a nice change to plain rice and I find that children like it. Wash the rice in three changes of water. Be gently when you wash the rice. Soak in water for 15 minutes. While the rice is soaking, place a large non-stick pot over medium heat. Add ghee and when it melts, add black and green cardamoms, cinnamon, cloves, bay leaf, and cumin seeds. Stir for 30 seconds to allow the spices to permeate the oil. Add the dry red chillies. Cook, while stirring, for another 30 seconds. Next, add the chopped onion. Stir and cook until the onion turns translucent. Add the green chillies and well-drained garbanzo beans. Cook, stirring occasionally, for one minute. Turn heat to medium-high and add water. When the water comes to a boil, turn the heat to medium, and add salt. Taste the water, it should taste salty, like the ocean! Drain the rice and add it to the water. Gently stir to combine the rice, water, and spices. Then, allow the rice to cook, undisturbed. The rice will swell and rise to the top. When you see bubbles appearing on the surface of the rice, it is time to cover the dish with a tight-fitting lid. Once you see steam escaping through the edges of the lid, turn the heat to the lowest point, and let the rice cook for eight minutes. Turn off the heat, but don’t open the lid immediately. Allow the dish to rest for five minutes before you serve. Puttu, Pazham and Pappadam – I can almost hear you say, “What an unlikely combination!” But ask any Malayalee and they will tell you that it’s a breakfast made in heaven. I’ve been thinking a lot about my mom and the lovely Kerala specialties she made for us. A nice way for me to pay tribute to my mom and her cooking is to share these recipes with my family and friends. It also brings back beautiful memories of helping my mom in the kitchen. Puttu is a nutritious, simple breakfast made with steamed rice flour and grated coconut. It is often eaten with a chickpea curry (kadala or black chickpeas), green gram curry (cherupayar), and with small yellow bananas (pazham), and pappadam. I remember my grandma had a puttu-maker (puttu kudam/puttukutti in Malayalam) made of bamboo. The taste of the puttu was permeated with the sweet essence that came from steaming it in the bamboo. For this recipe I’ve used Chemba rice flour which you can find at your local Indian grocery store. Chemba rice comes already washed, dried, ground, and roasted. The puttu was made in a puttu-maker that was also purchased from a local Indian grocery store. Preparing this dish takes about 15 minutes. I served it with small yellow bananas, pappadam, and sugar. Enjoy! Add salt to the water and stir until the salt dissolves. Put the rice flour into a large mixing bowl. Add one tablespoon of water, at a time, over the rice flour and mix gently with the tips of your fingers. The flour should be powdery and moist. Break any lumps that form. When you take a fistful of flour and gently squeeze it, it should hold its shape for a second, and then crumble. This test indicates that there is enough moisture in the rice flour and it is ready for steaming. Cover with cling wrap until ready to use. Fill the puttu kudam with water up to two thirds of the way. Put the lid and let the water come to a boil. Now fill the cylindrical tube part of the puttukutti. First put the flat disc with the holes in the bottom. This helps to keep the coconut and flour in the tube. Put two tablespoons of grated coconut, two small fistfuls of flour, two tablespoons of coconut, two fistfuls of flour and end with two tablespoons of coconut. Put the lid and place it on the puttu kudam. Steam for eight minutes. Steam should come out of the small holes in the lid. Remove the tube from the puttu kudam, open the lid and using the handle of a thin, long wooden spoon or dowel, slowly push the puttu on to a plate. Do the same with the rest of the rice flour and coconut. Serve puttu with bananas, pappadam, and a little sugar. It’s that easy.